On Friday, August 5th 2005, the Hobos set out of Denver late in the day as most had to work. Hobos Mark Jensen (TJ), Dan Bader (TJ) and Denise and myself (CJ7) and my jeepin-sidekick Molly met up about 5:30pm at the I-70 Morrison exit and headed out West on I-70. 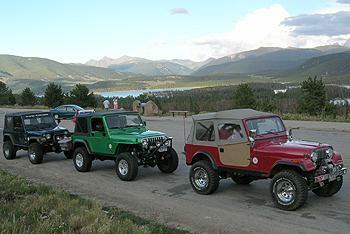 We met up with Paul 'WeiszGuy' Weisz and his son Brett (CJ7) at the Dillon overlook. 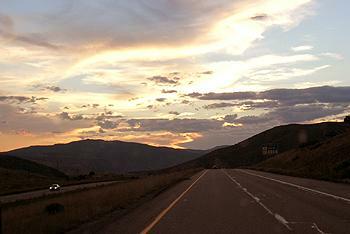 Once together, we headed west again on I-70 to the Wolcott exit (157), and turned north. The sun was pretty much down by now, which made travel a little tricky on the small state Hwy 131 for about 20 miles to McCoy. 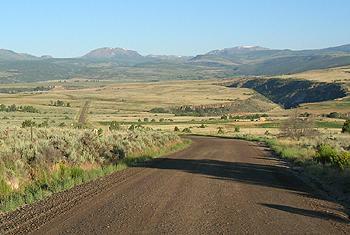 At McCoy, we headed west along the Colorado River on a dirt county road. Since it was late and dark, we decided to camp at a BLM campground along the Colorado River and the main East-West railroad line (didn't know that until we were already set up). Being a few hundred feet (the tracks were across the river) didn't seem to be far enough, as every time a train came by was pretty loud. Only the heavy sleepers slept thru all of them. I swear some of those trains seemed and sounded huge (as the ground shakes under you). We make skip that campground next time. Bright and early on Saturday August 6th we arose, packed up, aired down, and were ready to leave 'camp' by 8am. 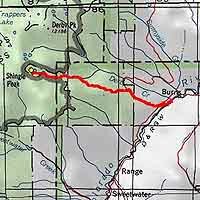 I led us West along the Colorado River until we reached Burns. 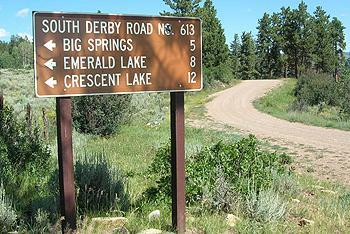 Just past Burns a mile is Derby Junction, where you take a right and head up the switchback to the top of Derby Mesa (County Rd. 39). Derby Mesa is real nice, with fields of grass spotted with aspen groves. We finally reached the turnoff to Crescent Lake (Forest Road 613). 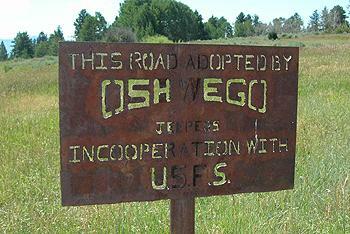 The Crescent/Mackinaw Lakes Trail is adopted and maintained by the Oswego Jeepers. 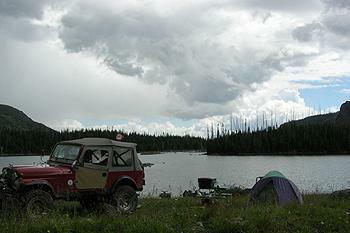 Well at ~9am, we had some 12 miles of jeepin' to Crescent Lake (10,758'). This was everyone's 1st time on this trail. Once on 613, there were far and few places to make any time or speed. 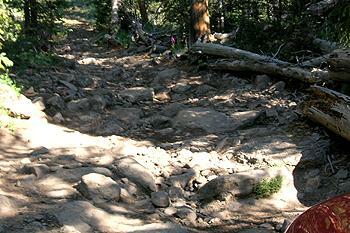 The early part of the trail is rocky as it follows along the top part of the mesa for a good 3 miles. This section has many long small to medium embedded rocky sections that jar you many a times. No speed here, only until we arrived thru Deer Park did the trail become more dirt like (and muddy when it rains I hear). 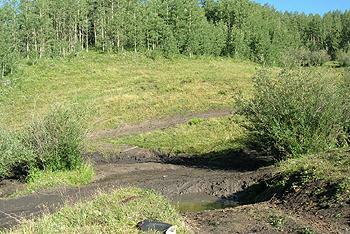 More small mud holes were passed thru then rocky sections until we reached the South Fork of Derby Creek. From here the trail is nice and scenic, as the valley opens up to await you. Crescent Mountain (12,241) stands at the north side to guide you in. 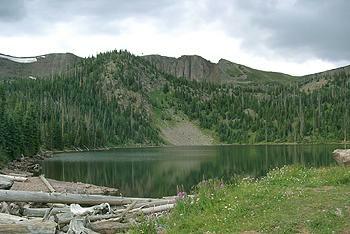 The trail goes into the Flat Tops, and the Flat Top Wilderness borders the trail up to the lake (a swath some half mile on each side of the trail). 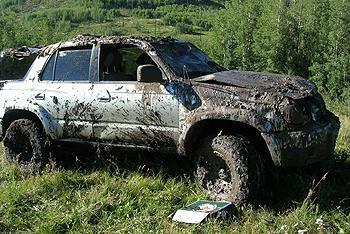 As we headed up the valley, we came across a rolled (into a mudpit) new 4Runner. It look like it just happened as the mud was fresh. But, there was no one around. Just the 4Runner and some stuff that spilled out. When we did come back thru on Sunday it was gone. There must of been a big fire here (mainly on the hills to the South) some 30 years ago. We passed some burned tree logs standing and laid down for awhile. The aspens and spruce trees were growing back, but they were also growing really close together (good deer country though). Heading up the valley along the creek, meadows open up and the creek meanders affording some nice ponds for Brook and Brown Trout fishing (you could see them from the road!). They are too smart though, they can see you coming and scatter. 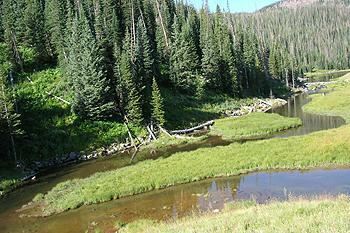 Up past the meadow and Emerald Lake, the trail gets more difficult and rockier. It seems to encounter a rock layer that the trail follows. I enjoyed this section up to the lake. 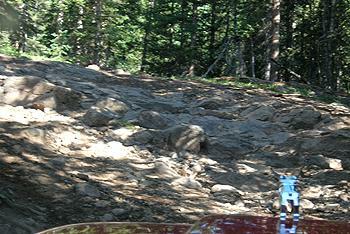 It has many rocky sections with medium to large rocks to climb over, while still maneuvering thru the tight trees. 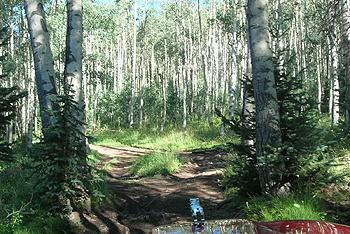 This is the 'Jeep Trail' as advertised. After the rocky fun sections we were rewarded with Crescent Lake and Mackinaw Lake to it's West 100 yards and 8 feet higher. Mackinaw seems to be deeper but it's smaller then Crescent. 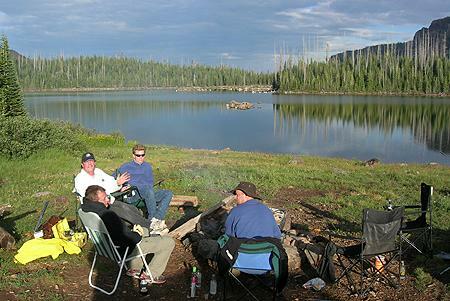 We found a nice open spot between the 2 lakes and set up camp around 11:30am (so it really only took us 2.5 hours up). Now it was time to relax, try our hand at fishing (all we caught were some suckers). Though Dan did catch a Brook Trout. The rest of the R & R day started to get cloudy about 3pm, then lots of lightning (not good when your camping in the open). Then came small pea-sized hail, and lots of rain. In about 20 minutes it passed. Then in an hour some more rain came and passed. But the clouds cleared up at dusk, and afforded us a beautiful sunset on the mountain across from Crescent Lake. 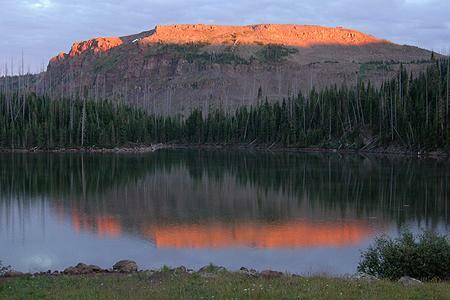 As soon as the sun set over the Flat Tops, the cold came on (as we were at 10,800') and the night was pretty chilly. We did have a campfire to keep some warm, but soon it was time for bed. Up after the sun finally peaked out of a cloud on Sunday morning, it warmed up a little. I believe it got down to about 35 degrees, as frost was abundant. We all packed up our gear, and by 8am we were ready to retrace our tracks all the way back down the Crescent Lake Trail. By about 10am, we reached the Burns road along the Colorado River. 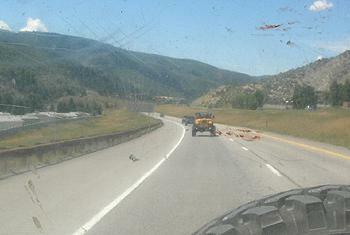 We turned South and headed towards Dotsero and I-70. After finally reaching I-70, we stopped for some air and gas in Gypsum. 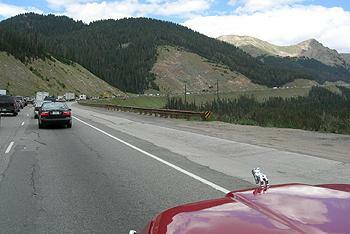 We turned East again, and followed I-70 up and over Vail Pass down into the Dillon area. Well, it was Sunday afternoon about 1pm, and we hit a traffic jam just East of Dillon all the way up the hill to Eisenhower Tunnel. It opened up past Georgetown, but stopped again and we took some side roads for awhile. All in all, it took another 1.5 hours with the traffic. 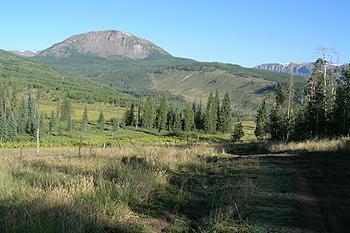 We all reached Denver safely around 4pm, and had a great time trying out the Crescent Lake Trail. A fun Hobo weekend!! A look out my back window (we were somewhere near Eagle)..
JAM way back on West side of Tunnel!!!! All the way to Idaho Springs basically! 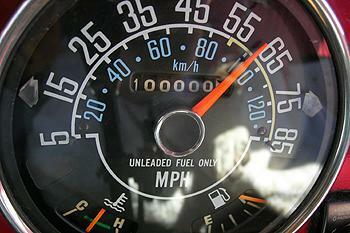 My 1982 Jeep's odometer finally hit 100,000 after 23 years!!! 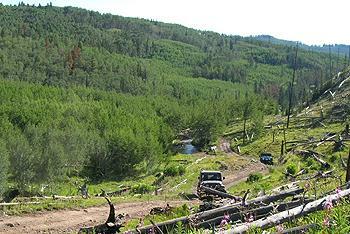 *4x4trails.net directions: From Denver, take I-70 West to Exit 133 (Dotsero). 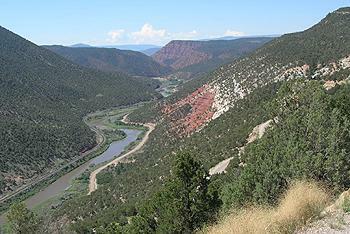 Take Colorado River Road/301 North to Derby Junction(N39°52.16', W106°54.36'). From here, you'll take Road 39 West to FR 613. 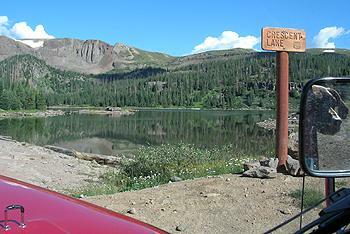 FR 613 will take you along Deer Creek past Emerald Lake and up to Crescent and MacKinaw Lakes (N39°54.58', W107°9.39').